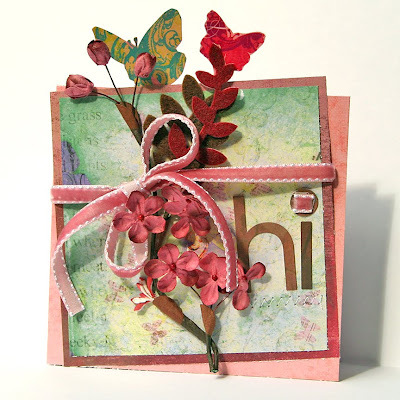 Label Tulip Blog: Card Kits are coming to Label Tulip! 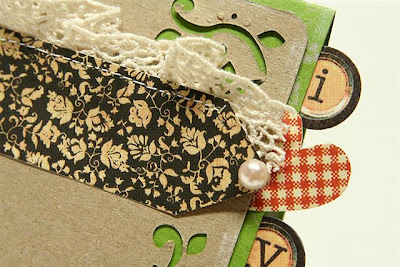 Card Kits are coming to Label Tulip! card kits that you can purchase monthly here at Label Tulip! The card kits will begin next month in October and are just going to be sold as an add-on kit right now. No subscription needed! You pick and choose which card kits you want to buy. This kit is going to feature 12x12 papers, so please feel free to use it for layouts, or anything your heart desires to create. However, a bonus that you get when you purchase this kit is a full set of directions including photos and patterns to make 4 cards created by me! You will NOT need to purchase the directions separately. Upon purchase, you will be sent a code to go on-line and obtain the directions. I wanted to show you a sample or two of what you will get with your card kit, so here are directions for two cards that I made last month with the add-on kits! Cut pink paper from kit 6” x 9 ½”. Fold in half for card base. 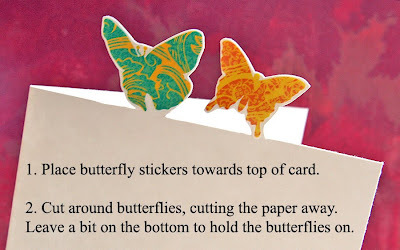 Attach 2 butterfly stickers near top of card base. Cut around butterflies, cutting the extra paper away (see photo). Cut purple paper 4 ½” x 4 ½”. Cut floral paper with butterflies on it 4 ¼” x 4 ¼”. Attach to purple paper. Cut a 5 ½” length piece of the Prima flower sprig and adhere to card with glue dots. Attach a piece of the felt leaf sticker near the top also. Attach letter stickers to spell “hi” (or any sentiment you wish). Zig zag stitch under the sentiment with sewing machine. Wrap finished front piece with ribbon and tie in a bow. Cut a tiny square of ribbon to attach to the dot of the I in “hi”. Adhere finished card front to the card base. Finished size: 6”high x 4 3/4” wide (with butterflies hanging off the top). Fold green Prima packaging in half for card base. You may have to cut the bottom edges slightly to make the card stand up straight (the scallop on the bottom of the Prima packaging). Just trim straight across with scissors. Cut kraft colored Prima packaging 4” x 3 ¼”. Brush edges with white paint. Zig zag stitch with sewing machine along the bottom left edge. (see photo above) Attach to card front. Cut arrow using pattern that is included from the black floral paper. Fold ribbon over onto itself several times, every ½ inch or so. Tuck under edge of arrow and stitch onto arrow with sewing machine. Adhere a pearl to the point of the arrow. Attach finished arrow to card. Pop out letters to spell “I” and “you”. Adhere them to the right edge of card, so they hang off the edge of the card. Using a heart shaped punch from your supplies, punch red plaid paper into a heart shape. Tuck heart under kraft paper and adhere between “I” and “you”. We hope you will enjoy the lower price point to these ($20-25). Please let us know if you have any wishes for particular items in the card kits as well! awesome Idea, these are fabulous! YEA! 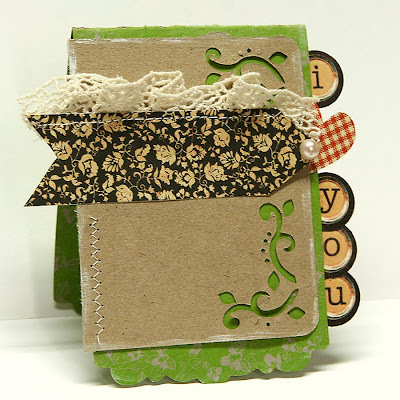 This is a great idea....love the card previews and have been looking for a card based kit-so this is perfect! Sign me up! Great idea!! Ahhhhh...YOU AMAZE me with your creative ideas with cards....I'm really excited for this highlighted addition to the kits...and that you are doing this! These card instructions are amazing and I know our users are going to LOVE them!